George Morris introduced the crest release, then regretted it. Here's what he recommends now. Most American jumpers use the crest release, which, when done right, is just fine. The problem is that it is rarely done right. To avoid the mistakes that punish your horse when attempting the crest release, try learning the automatic release instead. 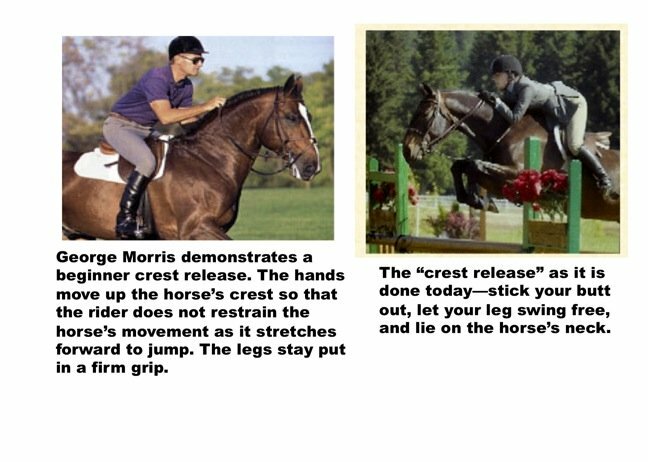 THE CREST RELEASE: George Morris introduced the crest release into the hunter circuit, then almost immediately regretted it. The idea was to have a student press her knuckles lightly into the horse’s neck so that when the horse jumped, her arms would stretch forward with the horse, allowing the horse freedom of movement. 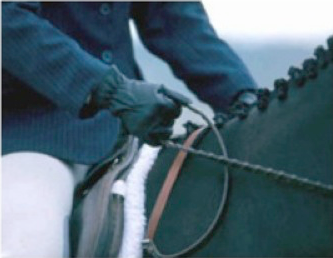 This would prevent the rider from hitting the horse in the mouth with the bit, an unfortunate result of a fixed hand that doesn’t follow the horse’s head as he stretches his neck forward in order to jump. Almost overnight, students everywhere were pressing down fiercely on their horse’s necks and resting all of their weight there at the exact moment when their poor mounts needed to reach their necks up and forward to jump. The crest release done this way not only interferes with the horse’s movement, it also encourages the rider to have loose legs because she depends on her hands and arms to balance herself when the horse jumps. As a result, the rider has a very unstable two-point leg position: Her legs swing forward or back when the horse leaves the ground. So the horse has to deal with an unstable rider as well as the extra weight of the rider directly on his neck as he jumps. If this sounds good to you, try jumping with a toddler on your back whose loose legs barely grip your waist as her hands fiercely grip your face. Just keeping your balance would be a challenge! You would probably tell her to let up with the hands already, and grip more firmly with her legs. THE AUTOMATIC RELEASE: A better way to jump is to maintain a soft contact with your horse’s mouth as he jumps. As he stretches his neck forward to jump, your hands simply follow the motion, reaching forward. In order to remain stable during the automatic release, you must have a secure base of support. This means pressing your inner calves firmly onto the horse’s barrel so that you can safely maintain your balance as the horse jumps. Your hands are then free to follow the horse's motion. This is a much better way to perform a horse jumping release. Perfecting the automatic release allows the rider to develop a stronger leg position, better balance throughout the jump, and a more confident horse. It is invaluable for moving through the levels of eventing, hunter, or show jumping. Here is an excellent brief video showing the automatic release IN SLOW MOTION. The rider is Sydney Hutchins, the 2014 Platinum Performance/USEF Show Jumping Talent Search Finals West and the 2014 ASPCA Maclay Regionals West. You'll want to watch this one again and again. Her technique is perfect! Note that when teaching the automatic release, the driving rein is used. This is easier on the horse's mouth because it is easier for the rider to release forward when holding the rein this way.